There will be a beautiful triple conjunction of Venus, Mars, and the young Crescent Moon four days from now on Friday. 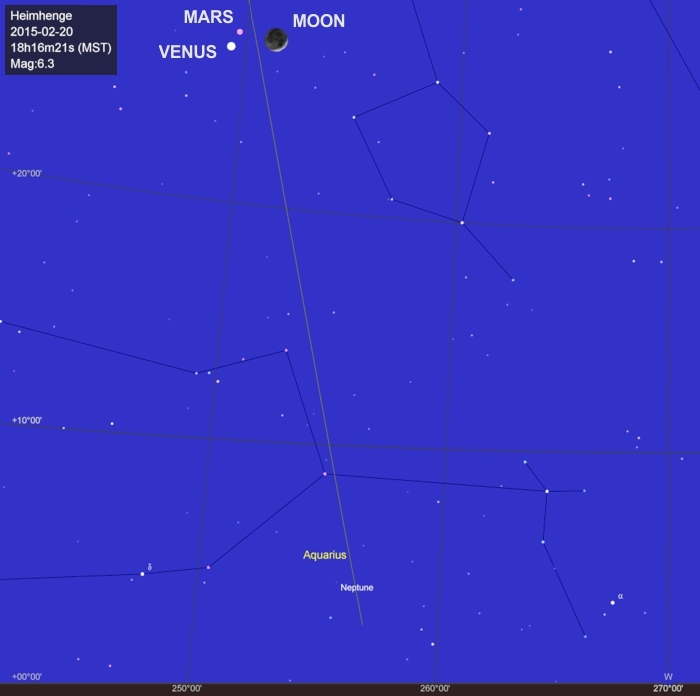 Venus and Mars will be closest on Feb 21, when they’ll approach within 25 arcminutes of each other. That’s less than half a Moon-diameter (≈ 30 arcminutes). The view will be striking, especially through a scope at low power, as both planets will be visible in the same field of view. But on the 20th, Venus and Mars will be joined by the Moon, with all objects inside a tight 1°38′ diameter grouping (about three Moon-diameters). You should easily see the Moon and Venus after the Sun sets. Mars will be the faintest of the trio, so you might want to wait till it gets a bit darker. By 7:30 pm, the trio will sink so low in the western sky that they’ll be difficult to spot. Especially if you have buildings or trees or mountains to your west. The Moon will be just a tiny sliver of its full disc, only about 2 days past New Moon. The night side of the Moon should be well-illuminated by earthshine. If you follow that link, you’ll see a not-so-great photo of earthshine from back in my B&W newspaper era (since embellished with a yellow Sun). The geometry of earthshine is nonetheless well-shown. Venus will be a bright bluish-white dot. Through good binoculars, or even a modest telescope, you should be able to see that Venus goes through a cycle of phases just like the Moon. Mercury does the same. A few weeks ago, I captured a photo of the two that shows those phases. You can see it in my Jan 19, 2015 post. Mars will display a distinct reddish hue compared to Venus. Whereas Venus is shrouded in thick clouds (which reflect sunlight strongly), the surface of Mars is covered with Fe2O3 (iron oxide aka “rust”). That makes Mars’ albedo (a measure of reflectivity) a mere 29%. By comparison, Venus’ albedo = 75% — the highest of all the planets. In addition, Mars is currently around 320 million km (200 million miles) away from Earth, compared with 220 million km (138 million miles) for Venus. Mars is also farther from the Sun than Venus, so it receives about 75% less light to reflect. People have asked me whether two planets can exactly line up. The answer is “yes” but it’s rare, because the orbits of the planets are all slightly tilted with respect to each other. Only about 20 exact conjunctions have occurred since the invention of the telescope in 1610. The next one won’t be until Nov 22, 2065, when Venus will pass in front of Jupiter. You can see a comprehensive listing of these rare events here. It was an amazing experience. Plus, now I know what Friday’s Dow index will be, and which stocks to invest in. 🙂 But seriously folks, the date of posting (Feb 16) is at the top left corner. The date mentioned in the post itself (and in the title) is Feb 20. That gives readers time to prepare, weather permitting. The chart in this post was generated by Sky Chart, a free open-source virtual planetarium that runs on my computer. It lets me display the sky as seen from any point on Earth, for any date and time (past or future). Unfortunately, it does not display the Dow index.